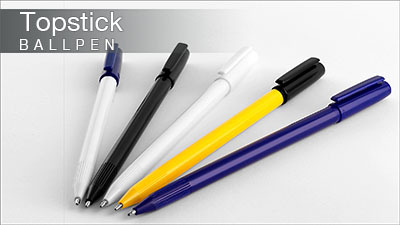 With its high gloss plastic barrels and contrasting caps the Topstick Ball Pen has universal appeal because of its low price point and large colour range. It has particular appeal for more traditional promotions and where a conventional click-action pen would be considered too noisy in areas such as libraries, seminars and training rooms. It is fully compliant with current safety regulations; comes with a black refill containing documental quality ink and is available on an optional express service for those last-minute requirements. The Topstick has a removable cap that snaps into place at either end of the pen body and it contains a large breather hole to make it child-safe. The large barrel print area can be personalised in up to 6 spot colours and colour matching to your requirements is no problem. This pen can be provided with optional presentation packaging, including high visibility pen pots to display at your next corporate event.